Runners at different courses on Saturday with Barthelona crossng town to Caulfield and Lady Concetta to Kyneton for her debut. Lady Concetta will be the first to go in the Fillies and Mares Maiden Plate over 1450m with Patrick Moloney to ride from barrier nine after scratchings. The daughter of Tavistock has the benefit of recent jumpouts leading into the race and Mike Moroney feels this race is the right place to start. “Her work this week has been good and the distance of the race is an ideal starting point,” Moroney said. “I’m sure she will be better as the distances get further and from the wide barrier draw she will likely get back. Barthelona (pictured) runs in the last race of the day at Caulfield, the Benchmark 84 Handicap over 1400m with Michael Poy reducing his weight but an awkward barrier of 10 after scratchings. It is the second start this preparation for Barthelona who has won three times at the track. “His work this week has been first rate and we can't fault that or his condition,” Moroney said. 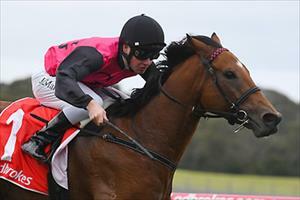 “The barrier is less than ideal from the 1400m start but if he can overcome that then I am expecting him to run well.